Eurocopter’s special edition EC145 Mercedes-Benz Style helicopter features a convenient modular interior and sets the standard for high-end corporate, executive and private operations. Created by a style team led by the Mercedes-Benz Advanced Design Studio in Como, Italy, the interior of the Eurocopter EC145 Mercedes-Benz Style is inspired by the exclusivity of high-end vehicles in the automotive industry. It features luxurious materials, elegant woods and ambient cabin lighting, along with cabinets such as cooling boxes, storage or infotainment. 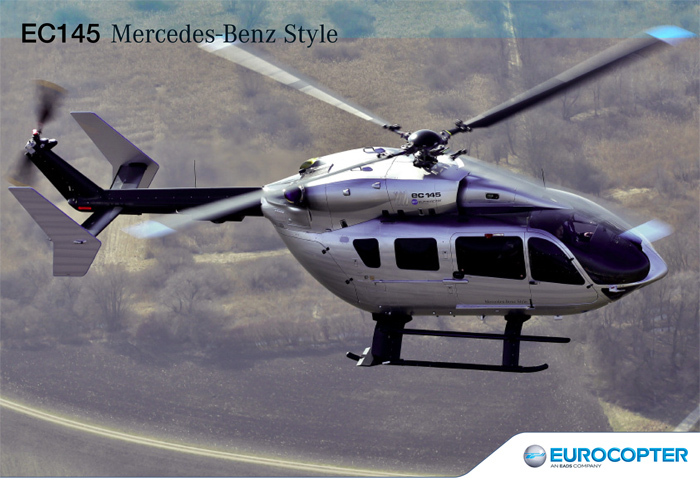 With its versatile interior, the Eurocopter EC145 Mercedes-Benz Style is specially designed for a broad range of luxury operations, from executive transportation and family outings to leisure and sport related voyages. 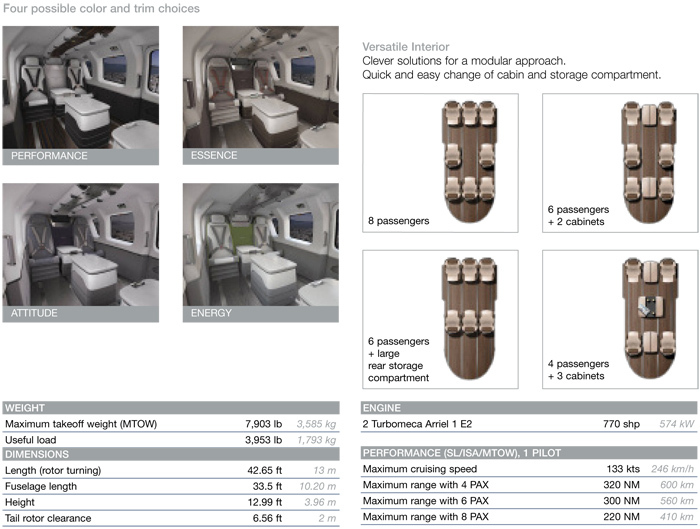 All seats are efficiently mounted on rails, allowing the cabin to be easily reconfigured to meet your specific needs. Various seating arrangements are available for up to eight passengers and the seats can also be quickly removed to make more room for luggage or other personal equipment. Numerous attachment points on both the floor and walls offer multi-purpose storage solutions. According to Eurocopter the EC145 is the perfect aircraft for incorporating the Mercedes-Benz Style, as this turbine-powered aircraft is at the top of its class in the medium-sized, twin-engine helicopter category. It combines Eurocopter’s cutting-edge developments in cockpit design and avionics, while also incorporating a hingeless rotor system and enhanced rotor blades that reduce sound and vibration levels – offering passengers the most comfortable ride possible. The EC145 is the only helicopter of its type that can seat up to eight passengers, and more than 400 of these aircraft have been sold around the globe for a multitude of impressive operations.